Wipaq offers the go to product when it comes to keeping safety and security problems at bay. They give you a list of such industrial looking devices that are rugged yet trendy such as the MR 200 turnstile model. It is a high intensity traffic tolerant system and is an access control mechanism which saves space and needs minimal maintenance. The main say in this is the reasonable cost of the equipment for its durable nature. 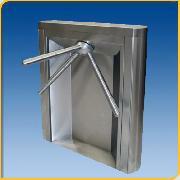 The MR 200 Turnstile has been designed with smooth, modern lines to blend with a variety of building architecture. The main body is constructed from 14 gauge stainless steel with a ¼" thick stainless steel base plate. The top cover is made of type 304-brushed stainless steel and has space to mount special card readers, indicator lights and/or other add-ons. The double wall construction provides additional space for electronics and to conceal all fasteners. The lid may be provided in granite, synthetic stone (Corian style), stainless steel, wood and other materials to match any architectural requirements. The MR 200 Turnstile can be equipped with an electronic coin or token acceptor which can be set for any size token or coin.